This car (parked in a driveway just where North Main swings around onto Main Street) hasn't budged all winter. in fact, upon closer look, it hasn't even been registered in quite some time - the sticker on the license plate says 1997.
looks like a nice vintage car, but it probably quit running. Oh, I love this kind of cars! Do you think it would work now? What a shame for it to rust away; your local kids must be well behaved. It would have been vandalised here! belle photo, vraiment impressionnante cette voiture sous la neige. beautiful photograph, really impressive this car under snow. 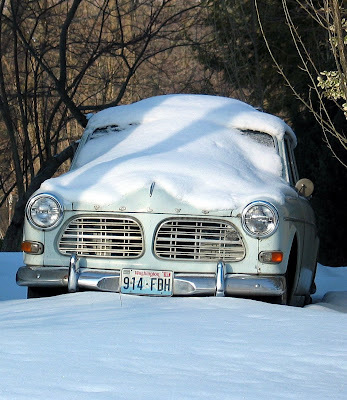 Very photogenic old car with pack of snow. Great photo as usual.